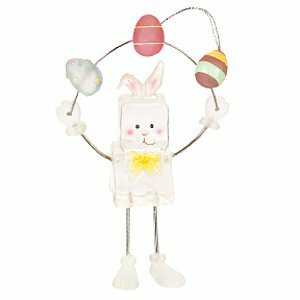 Fun Easter ornament features a bunny busy juggling 4 decorated easter eggs. Clear bunny has yellow bow, pink ears and white feet and hands. Ready to hang on your tree or you may stand him on a secure flat surface. From the Seasons of Cannon Falls Ice Fellas Collection. One ornament.